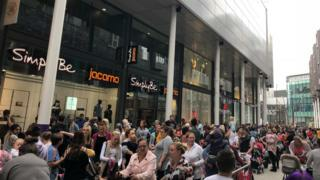 Many of the company's stores - including Sheffield's Meadowhall shopping centre, Birmingham's Bullring, Telford and Basingstoke - had to shut for the rest of the day following demand. 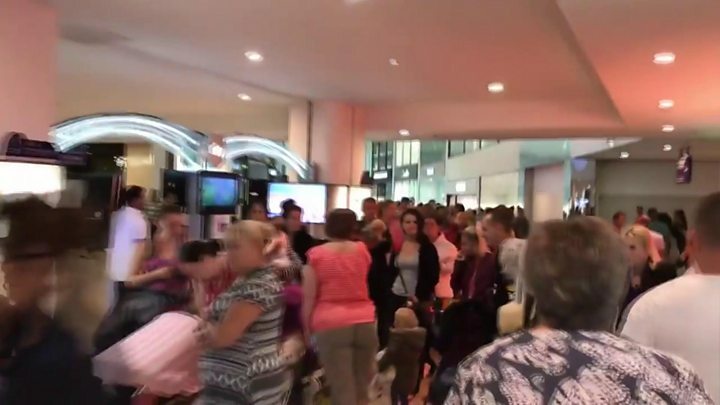 Leeds shopper Paul Shaw said: "Crazy scenes at the White Rose - Build-A-Bear is in chaos. "Queuing from the store, all the way outside, approximately five-hour queue. There are even police here trying to keep the peace." The queue was already enormous by the time I got there on my day off with my son. Someone told us that people had been queuing there since 06:30 BST and one woman told us she had travelled for more than an hour to get there because it was her closest store. We waited an hour-and-a-half but it was too much for my little boy and I thought there would be no bears left so we took a £12 voucher that could be redeemed another time. Parents on social media criticised the event, saying they were "disgusted" by the lack of organisation. Some said their children were left "heartbroken" when they could not get a bear. The shop in Newcastle's Intu Metrocentre stopped more people joining the queue "to ensure there are enough bears available for those in the queue". On its website Build-A-Bear describes itself as a "one-of-a-kind global brand that kids love and parents trust". The US brand was established in 1997 and has made more than 160 million teddy bears to date. Build-A-Bear stores offer children a chance to design, stuff and dress their own teddy bear. Customers can even add sounds and scents to their toy. Basic bears cost between £12 and £27 with limited edition toys costing more than £50. Clothing for teddies also ranges from £4.50 to £15. Amanda Bailey, 42, from Mickleover, Derbyshire, started queuing outside the Derby shop with her two daughters, aged two and five, at 09:10 and did not get inside until 12:40. "I thought I would give the queue an hour and then you get sucked in," she said. "Once inside it took a further two hours to get her bears because of the "stuffing counter queues". She said although she saved quite a bit on the cost of the £21.50 she bought for both children, she added: "When I look back I will probably think, 'what have I done that for? ', especially with what I will end up paying for parking." Jolene Quarrell, 34, of Swadlincote, said she and her friend spent about the same length of time queuing both outside and inside the Derby store. "I thought it would be nice for the kids but it's been a bit too hectic to enjoy it," she said. Chloe Lythgoe, 19, took her two children to the Warrington store and described the scene as "like something out of a movie". "Children were becoming distressed from the waiting and the heat inside the shopping centre," she said. In a statement on its Facebook page, Build-A-Bear Workshop said: "We understand our guests are disappointed, and we are working to address the situation. Some customers praised the efforts of staff working at stores around the country who remained calm during the situation and offered vouchers to those who could not get in for the event. Gemma Butler, marketing director at the Chartered Institute of Marketing, said: "This was an ill thought-out and unprofessional promotional execution, one that not only risks their own brand reputation, but has the potential to bring the wider marketing sector into disrepute." She added: "If their goal was to highlight demand, Build-A-Bear ought to have considered the consequences of thousands of children going home tonight disappointed and in tears." Image caption The Intu shopping centre in Chapelfield, Norwich, warned customers the queue was "extremely long"